You can compare two images side by side. View an image from the patient's image history list. 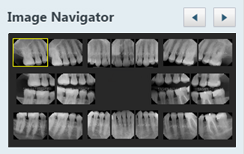 On the Images tab, select an image or a series (such as a full mouth series or bitewings). If you have selected a series, under Image Navigator, click (or tap) an image of that series. 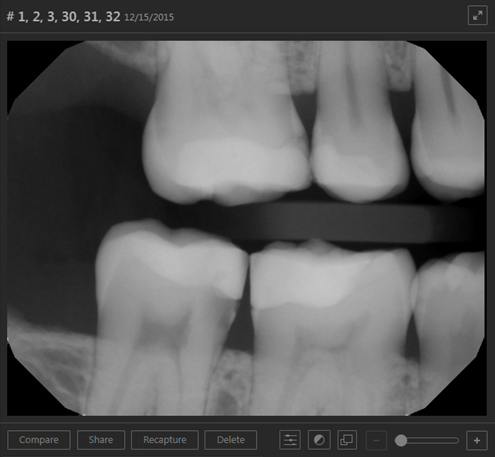 View one of the patient's most recent images. On the Patient menu, under Clinical, click (or tap) Imaging. On the Patient menu, under Clinical, click (or tap) Chart, Progress Notes, Quick Exam, Treatment Planner, Perio, or Imaging. Then, on the Imaging tab's menu, click (or tap) Show Most Recent Images. 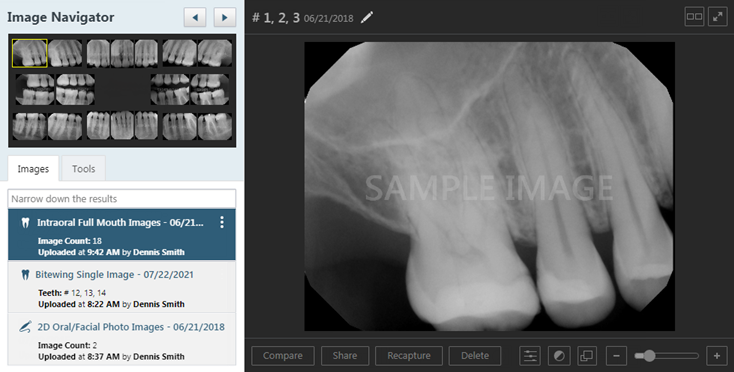 Click (or tap) any single image (intraoral X-ray, intraoral photo, extraoral photo, or extraoral X-ray) or an image within a series (such as a full mouth series or bitewings). The selected image appears in the viewing area. 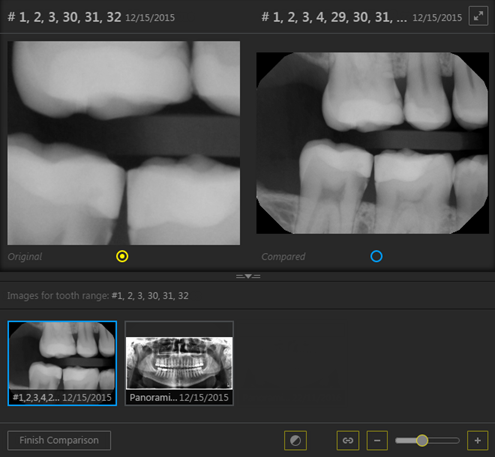 The images that have tooth numbers in common with the selected image (the "Original") appear on the Images for tooth range panel. 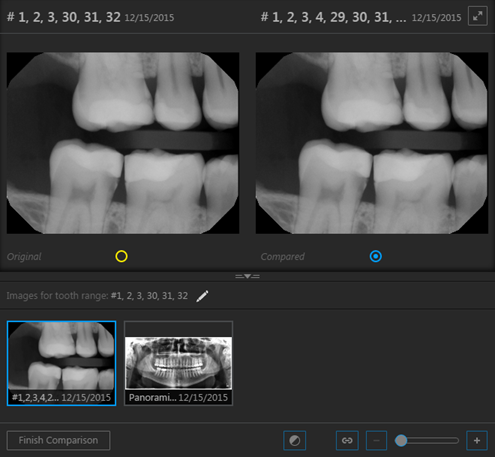 The first image on the Images for tooth range panel is selected by default, but you can select a different image to compare with the original. Use the (yellow or blue) Brightness/Contrast button to change the brightness and/or contrast. Use the (yellow or blue) Zoom slider to zoom in and out. 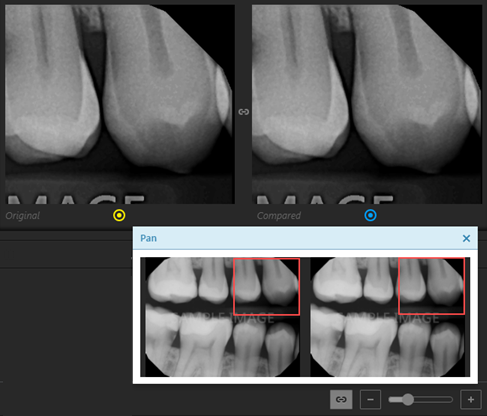 While zoomed in on an image, drag the blue square (on the comparison image on the Images for tooth range panel) or the yellow square (on the image under Image Navigator) to pan to another part of the image. Click (or tap) the Original or Compared image (zoomed and panned or not). Click (or tap) the (yellow or blue) Link button . Note: If you alter the zoom and/or pan of an image before linking it to the other, when you link them, the zoom factor and the position of the pan box (red box) of the other image is synchronized to be the same as the first. Now, as you zoom in and out and pan, both images are affected. Note: To unlink the images, click (or tap) the Link button . Click (or tap) Finish Comparison.